The right wallpaper can do wonders! 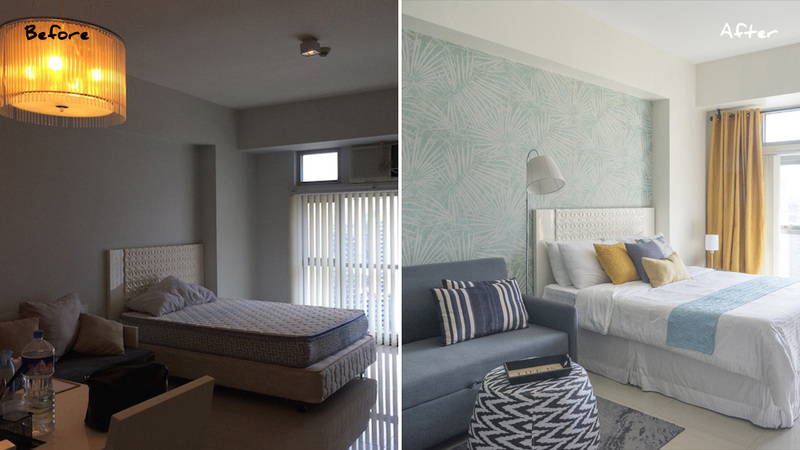 To improve this condo unit in Makati, interior designer Kimi Manuel knew that working with the right colors and bringing in patterns are musts to liven it up. Prior to the makeover, the space used to be all-white and furnished with basic furniture pieces and cabinets. To make it homey and appealing to possible renters, Kimi worked on the walls, improved the layout, and added colorful touches. A patterned wallpaper showcasing palm leaves complete the airy, tropical vibe of the space. If you’re in the process of renovating your home or if you’ve been thinking about saving up for makeover in the future, you can use the before and after photos below as guide. Investing in the right furnishings and opting for a playful color combination can work like magic.